The new filter is too noise when it operating ? The water smells bad? Only working three or even fewer months? Or the water flow make you so impatient? :D Trust us, we won't let you fall in those trouble again. Vitalium With the best quality & service, we try our best to improve these problems, we focus on user experience, because Honesty is the most important thing in trade. All our efforts are for you to drink healthy water, thank you! Technical Innovation: Faster water flow & Average life expectancy increased by 10% & Comprehensive and effective removal of impurities & Retaining beneficial and essential minerals for human health. filter element & operational principle: anti-microbial activated carbon filtration unit. About noise: With the output of fresh water, filter will noise-mute as well. CERTIFIED FILTER - NSF Certified standard, you can completely believe in our replacement water filter, because we had tested and ensure structural, safety and contaminant standards are met. er works with activated carbon filtration unit to reduce odor,chlorine taste,dist,rust,turbidity,heavy mental and harmful sediments, While keeping the beneficial and original minerals that good for human health. 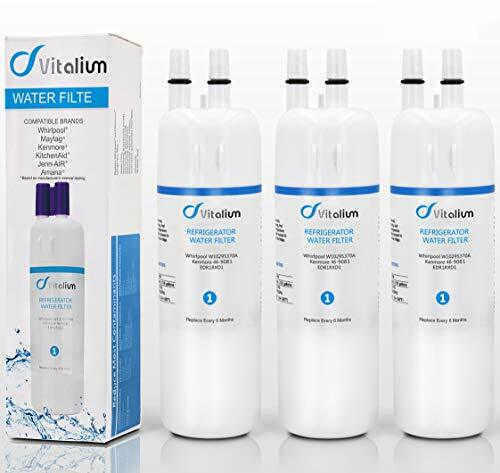 100% SERVICE WITH 100% SATISFACTION - If you are not completely satisfied with your Vitalium purchase, please contact us, your filter will be replaced or your purchase will be completely refunded, just make sure you love it cause that is what we work for. If you have any questions about this product by Vitaliums, contact us by completing and submitting the form below. If you are looking for a specif part number, please include it with your message.